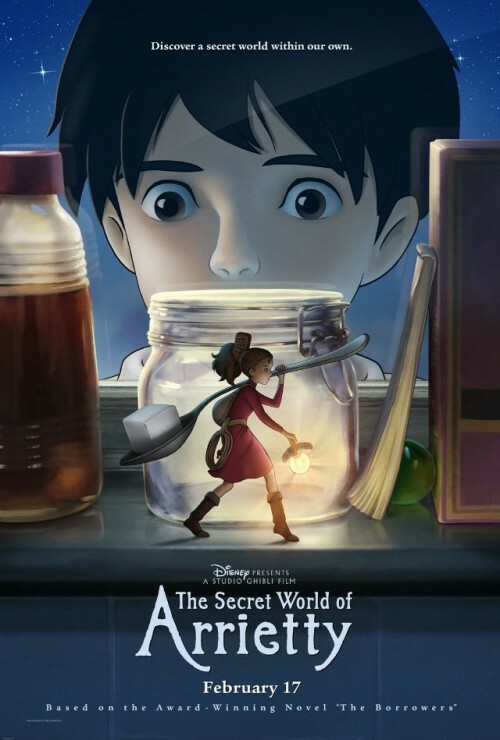 The Secret World of Arrietty: Magical…but not like unicorns…more like…David Copperfield. I can’t say enough about Studio Ghibli and director Hayao Miyazaki. The amount of wonder and childlike magic he brings to his audience in immeasurable I would say that the first time I was exposed to his work was in the form of a video game. It was early 80s when Dragon’s Lair led a brief flash of popularity in laserdisc based animated video games: Dragon’s Lair, Space Ace, and among others, Cliffhanger — which took scenes from the Lupin III series of animated movies. One of them was The Castle of Cagliostro. Normally in a laserdisc video game, the game gives you hints of what to do with the joystick and buttons to keep the story moving. Jump over the tentacle. Draw your sword and kill the man-eating plant. Stuff like that. And it usually made sense. With Cliffhanger, you were guided to do things that made no sense rationally, but somehow you understood that it was the right thing to do. You are chasing after gangsters who are chasing after a beautiful girl in a bridal gown, who nearly ran you down after you have been taking a break being on the run yourself after stealing from a Monaco Casino. This is were the story begins. Anyway, you are trying to run the gangsters down in an attempt to help the fair maiden. And then, the gangsters start lobbing WWII pineapple grenades out the back window. You move to the left and to the right to evade the explosions. As you drive along the windy southern France coastline, what is the obvious thing to do? — drive UP the side of the cliff, THROUGH the woods at the plateau above, and then DOWN the cliff again, to end up in front of the gangsters. It makes no sense, but somehow, someway, you know that, of course, this is the right thing to do. This is where that intangible magic lies. These movies are something to be experienced, not to be explained. And they don’t follow traditional Western storytelling techniques and tropes. At least, its not readily apparent. And it shows in at the box office. Howl’s Floating Castle brought in less than $4.7M in the States (31x more than Human Centipede, BTW), but $231M worldwide. $231 MILLION! Now we come to The Secret World of Arrietty. As Miyazaki goes into his 70s and has garnered nearly as many awards and nominations as years on this Earth, he passes the torch to one of his key animators, Hiromasa Yonebayashi. But this is not where things went awry. I believe that the first misstep was to base the film on a Western novel, Mary Norton’s “The Borrowers”. So right from the get-go, the very foundation of the story is grounded in traditional Western storytelling. The book is a classic. And its a great children’s book. So there is no fault in that. But the filmic translation of it, by a studio and artists who are known for inciting indescribable, irrational insight into the world, does not meet the bar previously set by Miyazaki. For the North American version, the characters were voiced by veteran Carol Burnett, comedians Amy Poehler and Will Arnett, and Disney staple Bridgit Mendler. Burnett is great, as she always is. As is Poehler. I’ve never heard Will Arnett be so subdued and speak so few words as in this film. I guess he used up his energy in Arrested Development. And to her credit, which she doesn’t have much of, Bridgit does create a character that we can care about and root for. Now, to veer sideways for a moment, why is there another set of actors for the U.K. release? Disney DOES know that Great Britain, the U.S. AND Canada, all speak the same language, right? Is Mark Strong a bigger box-office draw than Will Arnett? Perhaps. But can you really gauge that on the 10 words they speak in the whole film? And is someone in London saying “What movie should she go see then? How about Arrietty? It stars that bird from Hanna! She really kicked some arse in that one, she did”. Another oddity that I noticed is that there is a U.S. director. What did he direct? I guess the vocalization of the actors. In this case the director was Oscar winning sound designer Gary Rydstrom (who also directed the Pixar short, Lifted). Just a little nugget of trivia to bring up the next time you’re out drinking. Production-wise, Arriety is beautiful. In a world of CG animated movies where you can do things over and over, and maybe tweak the camera or the lighting if you want, watching a traditionally animated film is akin to listening to an organist provide the accompanying score to a film before synced sound appeared in 1927. You can’t possibly imagine how they do it. Its a dying art, unfortunately. Every camera angle has an individual painted backdrop. Every composition thought through completely before production work begins on it. Lighting and color drive emotion and story points. In animation, especially traditional animation, there are no accidents. The filmmakers have updated numerous pieces to bring the story a little more current, and give Arrietty and her miniscule family more props to play with. Double-sided sticky tape to help her father scale the leg of a chair is smile inducing. We, as an audience, are flip flopped between the real world and the Borrower world with deft visual and aural sleight of hand, making sure we know what scale we are at with details like having poured tea hold together in large blobs from the difference in surface tension on the fluid, or having sounds in the “Bean” (Being?) world as perceived by the Borrowers feel deeper. All of these contribute to a beautiful film experience. So, I would categorize it as better than 98% of the films released in 2011. But the Ghibli magic feels forced, and shallow, like a typical American movie. In representing past work that exudes the intangible magic of fairies, dragons, and unicorns, The Secret Life of Arrietty is like a Vegas magic show by comparison. You watch it. It’s magical. But ultimately, explainable.